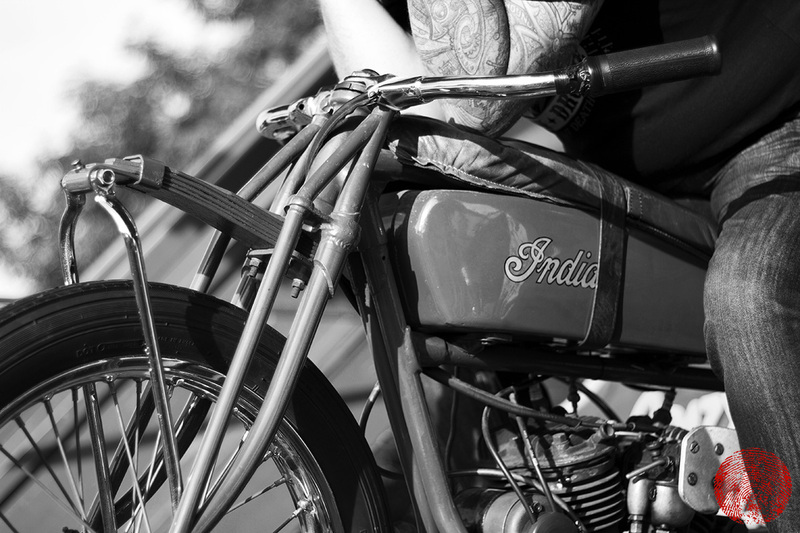 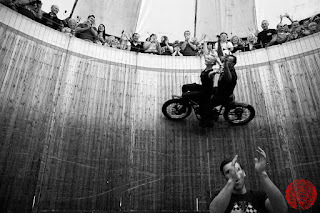 Watching from the outside, the wooden planks that make up the enormous barrel of the DemonDrome Wall of Death pulsate like a beating heart as the motorcycles race around on the other side. It seems like a big step, taking a motorbike from a ramped wooden boardwalk to a vertical wall and keeping it there. I guess that at some point though wanting to go faster and steeper leads to a Wall of Death, and that pretty soon even defying that most elemental law of physics isn’t enough to get your kicks. 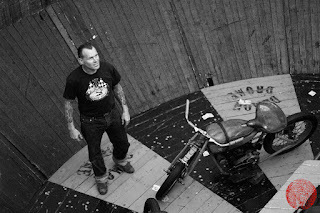 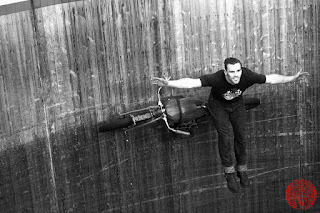 That must be how Duke Seymour ended up riding a vintage 1927 Indian motorbike, that’s easily three times older than he is, around his family’s Demon Drome Wall of Death stood up with his t-shirt pulled up over his face or performing a side-saddle iron-cross hanging out fifteen feet above the floorboards. 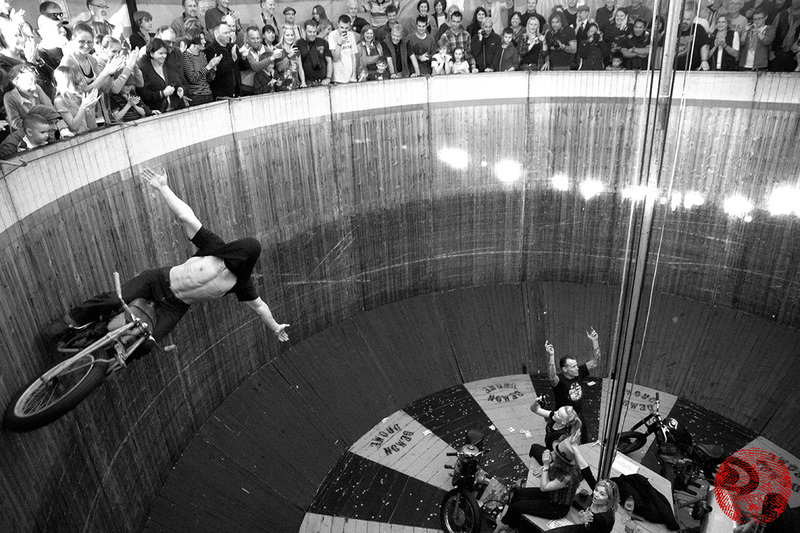 The Demon Drome Wall of Death arrived in the UK from America in 1927 and started touring the country with funfairs. Back then health and safety wasn’t such a big deal so the original owner, Elias Harris, went right ahead and built a car with a special platform on it so that he could drive it around his Wall of Death with his pet lioness, Rita, sat on the bonnet. 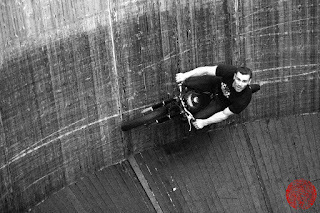 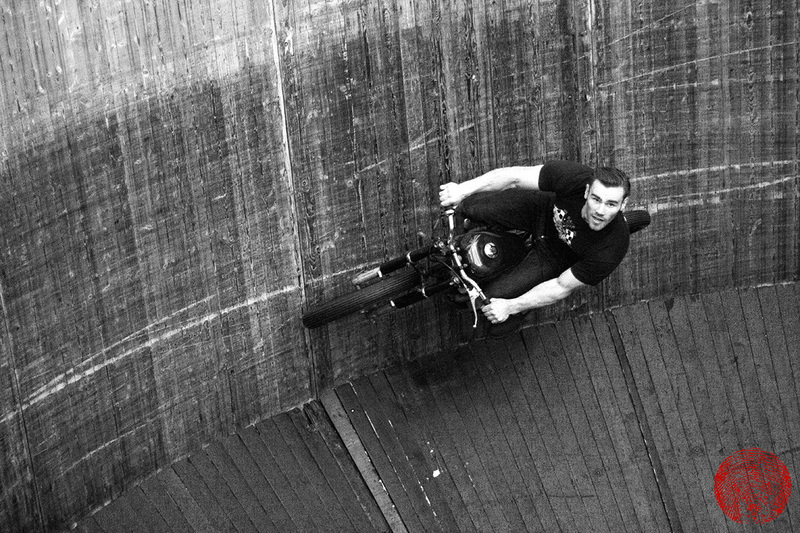 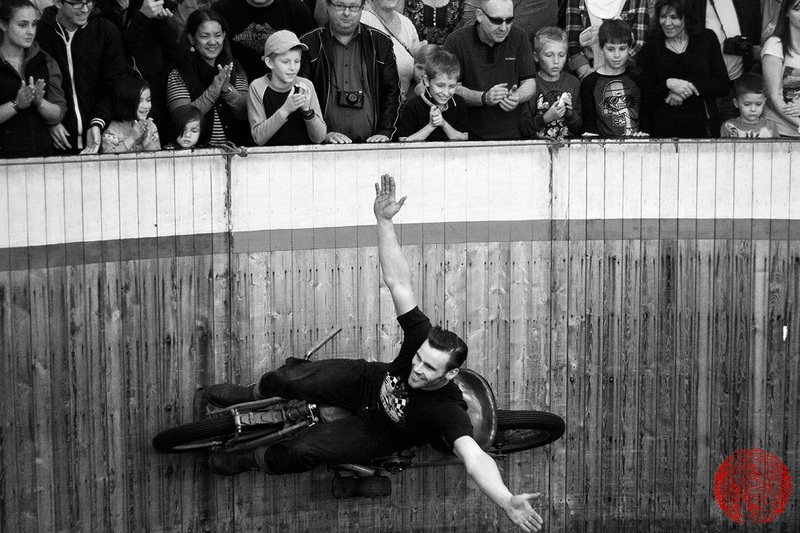 For the past ten years “Dynomyte” Dave Seymour and his family have toured the Demon Drome Wall of Death show around the UK and Europe, recreating the original show in every aspect apart from the live big cat. 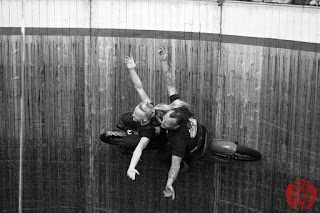 Dave and his son Duke ride 1927 Indians and custom Honda CD200 hardtails, performing tricks and racing each other, with Dave’s daughter Alabama even sitting on her old man’s handlebars with her arms outstretched for a few laps, as if it’s a perfectly normal thing for a teenage girl to do with her Dad on a weekend. 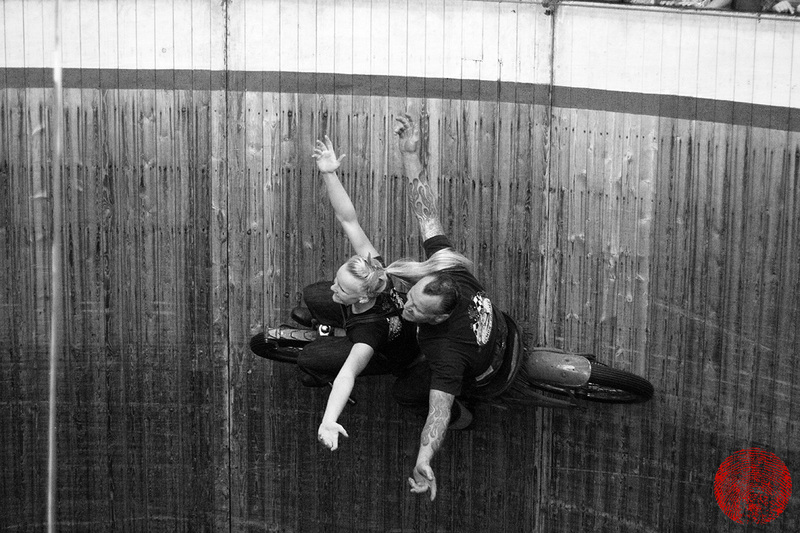 The wooden wall flexes as the bikes pass the knees of the audience who peer over the top of the giant barrel, providing the suspension that the bikes lack. 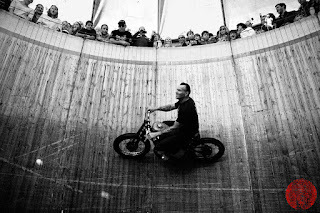 The faster the Seymours ride, the greater the centripetal force that pins their vintage whips to the old planks and the safer they are. 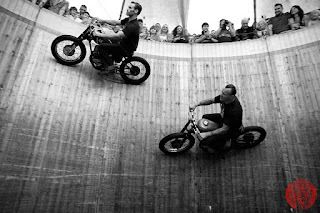 It doesn’t look it though - from the top looking down the whole story looks insane; the roar of the bikes is damn loud, it’s hot and the incense of exhaust fumes rise up from the middle. 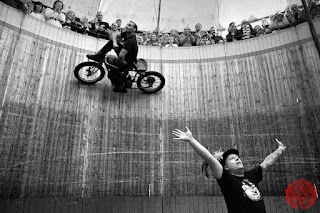 Every sense piqued, a spin on the teacups and a stick of candy-floss doesn’t seem quite so crash-hot afterwards.